The persecution of Christians is not a foreign reality in this age. Recently, Christian persecution has been vividly painted by the capture of over two hundred young girls in Nigeria, the execution of over one hundred-forty Christian students in Kenya, the beheading of twenty-one Christian Ethiopian men in Libya, and many other tragic persecutions of Christians throughout the world. In the face of such injustice, Christians may be tempted to stop praying and to abandon the faith, giving in to the idea that God will never serve justice. 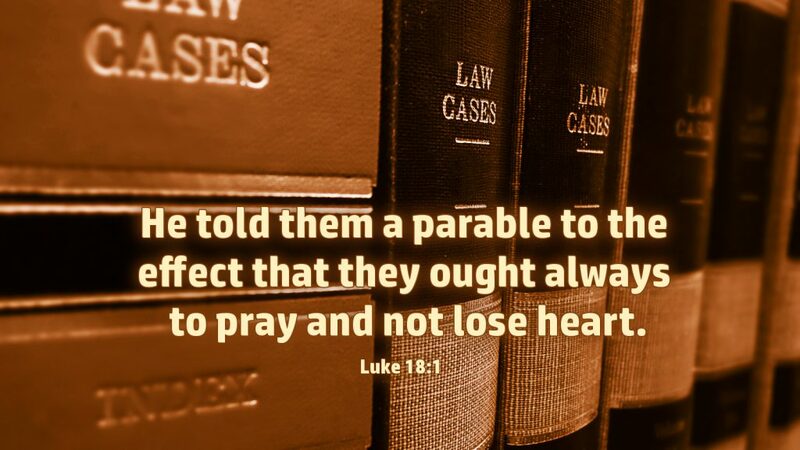 The Lord Jesus Christ calls us to pray incessantly, promising that God will bring about justice for his chosen ones who cry out to him day and night. He does not give us the date and time when God’s justice will be manifested, but he invites us to keep the faith and remain prayerful in the face of injustice. Because she never gave up, the widow ended up receiving justice from the unjust judge. If we don’t give up asking God, our just Judge, he will vindicate us when he serves justice through his Son, the Lord Jesus Christ. Not knowing when Christ will return, however, we are called to keep the faith and pray unceasingly. Prayer: Lord God, hear the prayers of your persecuted church and help us keep the faith, remaining prayerful until Jesus Christ comes again. Amen.